The student’s close contacts (who are at increased risk of infection) have been identified and provided with prophylactic antibiotics. 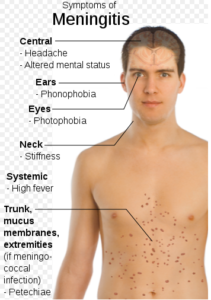 Meningococcal disease is a rare but very serious illness caused by a type of bacterium called Neisseria Meningitidis. People spread meningococcal bacteria to other people by sharing respiratory and throat secretions such as kissing, sharing food , drinks and smoking. Vaccination is one of the most effective ways to prevent meningococcal disease.